Urgent Name Help Needed: Their Baby Boy is Due Very Soon! Natalie and James are expecting their son in a few weeks, their first-born child. Nat is from a Chinese/Malaysian background, and her parents will help them choose a Chinese middle name. It’s lucky that the middle name issue is already solved, as Nat and Jamie are struggling to think of a first name! Nat likes Jasper, Jarvis, and Rupert, but Jamie doesn’t. Jamie likes Henry and Hugo, but Nat isn’t so keen. Nat and Jamie have a pet dog named Frankie, so the name Franklin, which Nat loves, is also out. Nat and Jamie’s surname begins with C eg Clarkson. Nat and Jamie, I notice a few name preferences you seem to have. One is for the classic-style solid English names like Edgar and Alfred which have been common since forever. 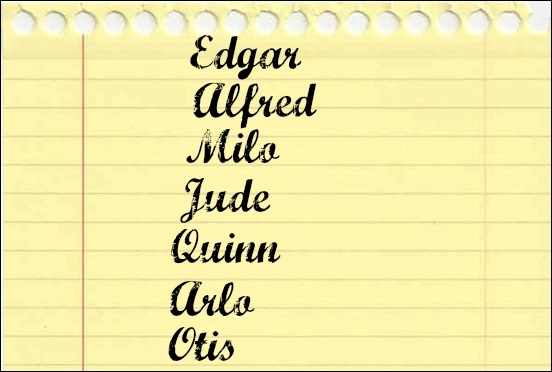 The other is for those smooth-sounding names which have only become commonly used fairly recently, such as Arlo and Quinn. Perhaps you could think about one which you would prefer, as this might influence the names of the children you have later. You really seem to like the “long” vowel sounds found in names like Milo, Jude and Otis. That makes Quinn something of an outlier for you, and as it’s a name often used for girls as well, I wonder if it really fits your desire for something manly? It’s also a bit of a tongue-twister with your surname. Jude is another name which sticks out to me, as it’s the only other name which is one syllable: I’m struggling to think of nicknames for Jude and Quinn. Your preference seems to be for a two-syllable name, although in general they don’t have obvious nicknames. Could it be that you are not so nickname-happy as you thought? If you wanted a nickname, you might want to go up another syllable, as it seems easier to find nicknames for longer names. With just a few weeks to go, I think you basically have two options. You can start to narrow down your current list to a top three or four that you think you are likely to use, and take that list with you to hospital. Once your son is born, you might feel he is definitely a Marlowe and not a Milo, or an Alfred and not an Arlo. Or, if you are not convinced that any of the names are quite right, you could consider a slightly wider selection of names that still fits all your criteria and your name style. I will suggest another list of names which seem to be in line with what you like. Don’t be afraid to choose the name you love best, even if it breaks one of your name rules. You are already having the middle name chosen for you, so that really leaves the first name spot open for you to express your individuality and follow your heart. NAME UPDATE: The baby’s name was Frederic “Freddie”! POLL RESULTS: The public’s top choices for the baby’s name were Jude, with 18% of the vote, and Theodore, with 24% of the vote. Roscoe, Otto, Owen, Hugo, Orson, Laszlo, Winslow, Beaumont, Ogden. – Roscoe: (Ros-Ko), From an English surname, originally derived from a place name, which meant “doe wood” in Old Norse. – Otto: (AW-to, OT-to), Later German form of Audo or Odo, from Germanic element ‘aud’ meaning “wealth, fortune”. – Owen: (O-Wen), Modern form of Welsh OWAIN. – Hugo: (HYOO-go, HOO-go), Latinized form of HUGH, meaning from Germanic element hug, meaning “heart, mind, spirit”. – Orson: (OR-sen), From an English surname which was originally a nickname meaning “bear cub”, from a diminutive of Norman French ors “bear”, ultimately from Latin ursus. – Laszlo: (LAHS-lo, LaZ-Lo), Hungarian form of Leslie or Vladislav. – Winslow: (WINZ-lo), From a surname which was derived from an Old English place name meaning “hill belonging to Wine”, Old English wine means “friend”. – Beaumont: BO-Mont, From French meaning “beautiful mountain”. – Ogden: (Og-Den), From a surname which was derived from a place name meaning “oak valley” in Old English. Good luck with your name search! Otis, Judah (Jude), Alfred are very nice names. I do know 3 female Quinns and 2 girl Marlowes. Hobart (Hobie, Bart), Hubert is maybe aRupert and Hugo hybrid. Stanley, I know one who is called Stosh, Wilfred. Arto could be another option – Finnish form of Arthur. Good luck! How about Magnus (nn Gus)? Best wishes as you welcome your son!